who died August 26th 1793 Aged Sixty Years”. From which Nolan line this John belongs is yet to be determined. The picture appearing below was taken September 26, 2015 by Jim Nolan. 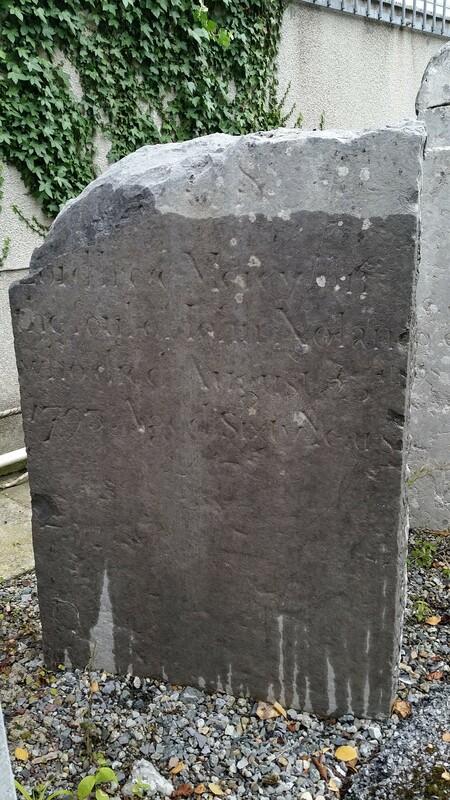 I have been researching my Nolan family ancestry for about fifteen years and have found a direct lineage back to Thomas Nolan C1560-1628 of Ballinrobe. 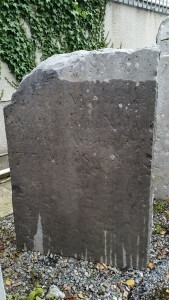 James Hardiman in his History of Galway refers to a Michael O’Nolan who rebuilt a family tomb of his Kilkenny ancestors in 1473. To date I have found little other information about Michael O’Nolan and am wondering if other Clan members can assist me in my research, which is being done for an article in the Newsletter.. I am researching the Nolan Family from the Old Province of Connaught particularly those from Counties Galway and Mayo. This family established at least three descendant lines from Thomas Nolan C1560-1628 to the current day. These lines are the Ballybanagher line, the Ballinderry line and the Logboy line. At this point it appears that I am the only known descendant who has taken the FTDNA Y-DNA tests under “The Nolan DNA Project”. It would help our research if there are any Nolan male members who believe they are a descendant from either of the three lines from Thomas Nolan, could take a test, even a Y-37 at this stage would help clarify some of the research recently undertaken. The above information was brought to my attention by someone named Anne in Australia who, despite not having any Nolan family connection, responded to the website’s appeal for information on early Nolan families. You can read here the full Newspaper Accounts of the Nurney Evictions which appeared in “The Freeman’s Journal” on 28 August 1869 and on 23 October 1869. These transcriptions were found online within the “Trove” database maintained by the National Library of Australia. Click here to view the Trove search results for “Nurney Evictions” .